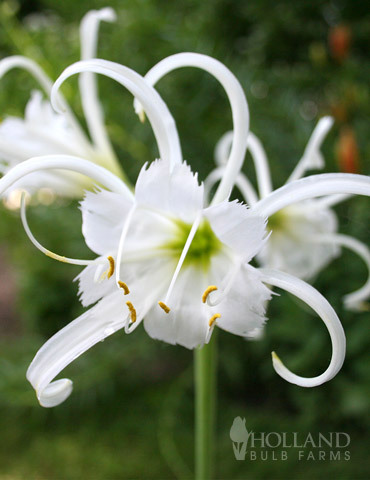 Unusual but beautiful, the Ismene Festalis (also call Peruvian Daffodil) looks almost to delicate to touch! This flower is known for their unique design and fragrance. These 4-inch flowers are borne atop 2-foot, leafless flower stalks in midsummer. Each stem may hold 2 to 5 flowers, which are white with green stripes. The leaves are straplike and may be up to 2 ft long. Each bag comes with 2 bulbs. Originally I purchased only 2 bulbs and these bloomed beautifully, overnite. Sweet scent and intricate flowers with nice foliage afterwards prompted me to get 9 more. Although I was taking a risk putting them in the ground so late, they came up! All of them. Four bloomed so far starting yesterday. Stunning addition to the garden. Easy to grow and the rabbit did not touch them. Highly recommend. Unique Addition to Any Flower Garden!! Spider Lilies are a very unique lily that has been around for a while. They make a unique addition to any flower garden. While they may look delicate, they are quite hearty and I have yet to be disappointed!! They were shooting. I planted them and they have come up immediately. They were packed well and shipped fast. Good thing since its in the high 90s here in Houston! Absolutely beautiful with a light fragrance. I loved them so much I bought 10 more from Holland Bulbs. They are prettier in mass. I have ordered from them for years because I receive the bulbs as scheduled and have never had issues with their products.